Bjorn Hansen today proved why he is the ‘Master of Marstrand’ with a faultless display of match racing to brush aside Ian Williams 2-0 in the finals of Stena Match Cup Sweden, the third World Championship Event of the 2015 World Match Racing Tour. In the first match of the Final, a pre-start tangle in the final 30 seconds saw Ian Williams receive an immediate penalty after he took control of the match. Hansen capitalised on the situation to lead Williams around the course and take first blood racing in the Stena AB boat. After a quick change into the Handelsbanken boat, the pair resumed their battle with an even, split tack, start. Hansen took the right side and when they came back together Hansen was able to push Williams back to the left. By the first mark Hansen held a slender lead which he kept round the course until yards from the finish line when a late lunge by Williams almost caught the Swede off guard. 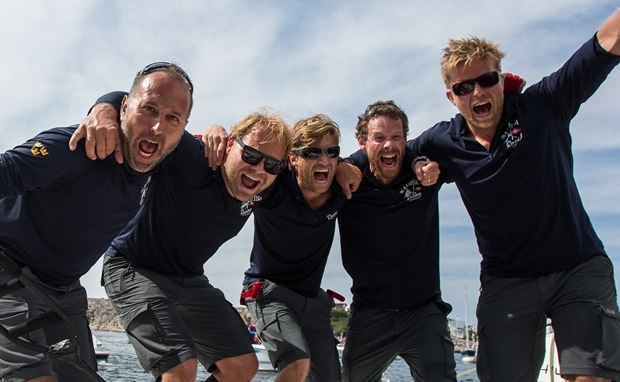 But it would take a lot more than that to rattle the man who has won the title here four times and he duly crossed the line to the wild cheering of the Marstrand crowd to take his fifth Stena Match Cup Sweden crown. Hansen commented: "It was a fantastic win for us, the guys did a fantastic job on the boat. We didn’t even dream about this when we came here. We actually felt a bit more pressure than before when we got the Hall of Fame on Monday, and it kind of felt like we needed to really show that we belonged in the Hall of Fame, and we really just wanted to sail the last day in Marstrand, because this is a dream for a Swedish sailor. It was just fantastic that we managed to win in the end." Williams added: "I think it was one of those days where it was tough to keep it close and to pass and Bjorn did a really good job on the start in the first race obviously with the umpire call, and then the second race was close but he just sneaked around the top mark ahead and from there it was really hard to even keep it close. I was pretty pleased with how we sailed, and we made a bit of a race of it at the end, but congratulations to Bjorn and his team, that’s four in a row for his team, they really do sail the boats so fast here, and they know the venue so well, it makes them hard to beat, and all credit to them." After leading Ian Williams 2-0 overnight, Keith Swinton must have thought his turn had come to make the Final, but a resurgent Williams came back and took three straight, sending Swinton to the Petit Final where he would face Taylor Canfield following his loss to Hansen 3-1. Swinton was still fired up for podium glory and delivered a 2-0 smackdown to the former ISAF World Champion Canfield. Swinton commented: "It was good to take out the petite final against Taylor Canfield, obviously we were a bit disappointed to not make the final after being two up yesterday on Williams, but it was very tricky out there this morning. I think we actually sailed very well, luck just didn’t fall our way. We’re really happy though still with third."